Before tablets, MS Paint, computers, or heck, even paper (ok, that last part is a flat-out lie), the only cool way to draw a picture was with an Etch-a-Sketch. Now, the minds behind the Etcher Kickstarter program want to bring the classic aluminum powder board into the digital present with an iPad add-on. Etcher is a specially designed case/dock that imitates classic old Etch-a-Sketch. It works like one, too, complete with those two directional knobs. The corresponding l Etch-a-Sketch app lets you save and share your line drawings. And yes, turning the iPad upside-down and shaking it will erase your drawing. The Etcher team needs contributions to start a injection molding production line so they can start manufacturing the plastic Etcher bodies. Underneath the shell, the physical knobs connect to an Atmel microcontroller board that’s linked directly to the iPad’s docking port. 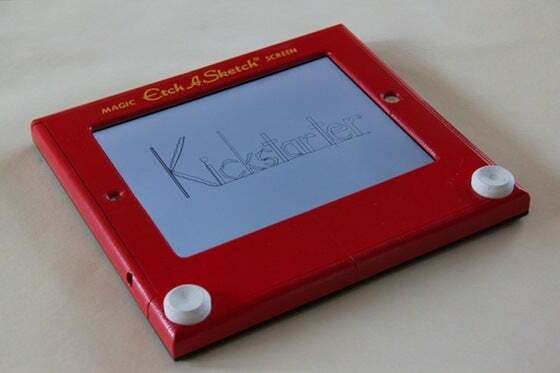 Right now, you can contribute as an early adopter to pick up your own red Etcher for a special $45 pledge. If you’re late to the party of the first 100 early adopters, you can contribute $60 for a red or blue Etcher. But wait, there’s more! If the project meets its funding goal of $75,000, the Etcher team will release its iOS code under an open-source license. With the source code, you could build your own knob-controlled games (think Pong or Battlezone). Contributing at the hacker level ($175) will get you early developer hardware and software, a final production model, and a vote on which open-source license the Etcher app will be released under. Updated May 10, 2012 to make a minor correction regarding the Etcher manufacturing process.